The inspiration for this dish from www.gfzing.com was a trip to the Garden Grille in Providence, Rhode Island. They make truly delish vegetarian food, much of which they will also prepare gluten free. This is recipe is NOT one of theirs, it is just inspired by their cooking. I did not have a chance to try their sesame-crusted tofu, unfortunately. The soup here is done in the microwave oven, for quick, efficient dinner preparation. It is easily adapted for vegetarians and vegans – just omit the fish sauce and adjust the salt. 1 package of extra-firm tofu, drained and slice the short way in to four slices, then cut the other way to make 8 squares about 3/4 inch thick. In a 1 1/2-2 quart microwavable casserole dish (such as Corningware), place the chopped onions, chopped garlic and 1 TB of oil. Cover and microwave on high for 5 minutes. Allow to cool for a few minutes before removing the cover (to avoid steam burns). To the cooked onions and garlic in the casserole dish add the rest of the soup ingredients from the red bell pepper through the currant jelly. Cover and microwave until the carrots are tender, about 10 minutes. Allow to rest a few minutes before you remove the cover, to avoid steam burns. Use a stick or immersion blender to puree the soup. Season with just a little bit of salt to taste. Adjust the sweetness. Set aside. 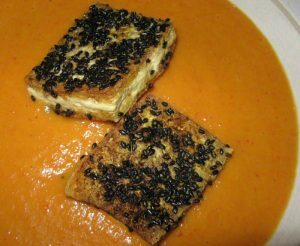 Mix the curry powder and sesame seeds and pat the mixture on to one side of each of the squares of tofu. Heat the oil and sesame oil in a large, heavy frying pan. When hot, add the tofu squares, seed side up. Fry over medium heat, undisturbed for 4 minutes. Salt the tofu squares. Use a spatula to turn the tofu squares and fry the other side undisturbed for 3 minutes. Salt the other side. The frying will crisp the tofu, rendering it golden brown. Remove the fried tofu from the pan. Reheat the soup briefly and serve 2 squares of fried tofu, seed side up, on each serving of the hot soup. Serve with lime wedges, and a salad made from chopped arugula, fresh mint, orange juice, olive oil, gluten-free mustard, salt and pepper. 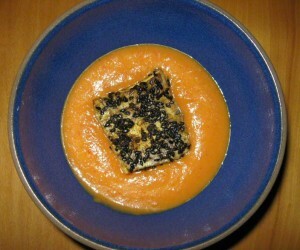 This is an easy, vegetarian gluten free soup from the website gfzing.com to serve as a first course or as a main course with an accompaniment of gluten free toast or scones. In a large pot, place 3 leeks, cleaned, trimmed and chopped, 5 Red Bliss potatoes, peeled and cut in half, and about a third of a head of cauliflower, cleaned and cut in to flowerets. Pour in water to cover (6-8 cups), add 2 teaspoons of salt and bring to a boil, turn down to a simmer and cook until the potatoes and cauliflower are tender, about 20 minutes. Add 2 tablespoons of ghee (clarified browned butter) and a 1/2 teaspoon of freshly ground pepper, then puree the soup carefully using an immersion blender stick until it is velvety. If you do not have an immersion blender, use a regular blender or food processor, being careful not to burn yourself with the hot soup. Note: If you are a wheatavore serving a gluten-free diner, make sure to use plain fresh water to make this soup. Don’t use water that was just used for cooking pasta, for example. Test the soup for salt and balanced flavors, then serve sprinkled with a little chopped parsley if you have some. It would be fine to substitute other vegetables for the cauliflower – for example: carrot,s sweet potato, broccoli, peas, spinach etc. Make sure all the ingredients are gluten free. Loaded with vegetables, this simple, easy gluten free soup can be put together in under a half hour. Use other vegetables in place of the ones specified in this recipe – whatever you have available. Cruciferous vegetables (Brassicaceae family) like cabbage, broccoli, cauliflower, turnip, watercress etc. or quick-cooking greens like spinach are ideally suited to this type of soup. Simply heat the sesame oil, stir fry the garlic, ginger and scallions or onion for 30 seconds, then add the water. Bring to a simmer, then add the dried shitake mushrooms, cauliflower, asparagus and yam or sweet potato. Simmer for 10 minutes until the yams are tender. Stir in the gluten free miso paste, season with pepper and serve hot. A surprisingly rich and satisfying vegan soup. Double-check to make sure the miso paste you choose is gluten free. This tasty soup has plenty of flavor and lots of fiber. It will fill you up on a cold, rainy day! Simmer for 20 minutes until carrots and parsnip are cooked through. Using an immersion blender, and taking great care to follow the instructions so you don’t get burned by hot soup, thoroughly blend the soup, adding up to one cup of hot water if needed. You may add heavy cream to reduce the intensity of the flavors or make the soup in to a richer creation, but it is also ready to eat as it is. 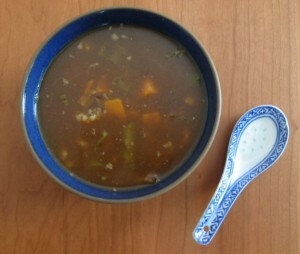 To make this soup for a vegan, use vegetable oil instead of ghee/butter, use vegetable stock, and do not add any cream. This recipe from Gf-Zing! is perfect for a cold fall day when eggplants and tomatoes are still plentiful at the local farmers’ market. Brush all the vegetables with olive oil. Roast for 45 minutes. Scoop the eggplant flesh in to a large pot. Discard the eggplant skin. Add the rest of the roasted vegetables, 4 cups of gluten free chicken or vegetarian stock, and 1 teaspoon of dried thyme. Bring to a boil, lower the heat and simmer the vegetable and stock mixture for 45 minutes. Puree the soup using an immersion blender or by transferring the soup to a food processor or blender. Season to taste with salt, black pepper, and a small amount of sugar if needed. Serve the soup with crumbled goat cheese or cheddar to sprinkle on top. This recipe was developed by Gf-Zing! 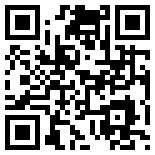 , which celebrates flavor in the gluten free world. Put 2 sliced onions and a tablespoon of butter in a non-stick soup pot. Sprinkle with 1 teaspoon sugar and cover the pot. Cook over low heat for 5 minutes, then remove the lid and brown the onions. Cover the pot, and simmer for 10 minutes until the carrot slices are tender. Serve with freshly grated Asiago cheese for sprinkling on top. Make sure to use only gluten free ingredients. This mulligatawny style soup is gluten free, dairy free and vegan. The recipe has been developed and tested for the gluten free community by Gf-Zing! Briefly fry the onions, garlic and ginger in the oil until soft. Add the curry powder and the turmeric and stir to coat the onions. Add the rest of the ingredients except the salt, and simmer uncovered for a half hour. Taste the soup. Add the salt, cook over low heat for 15 minutes more, and serve. Make sure that all your ingredients are gluten free! A nice bowl of highly flavored, steaming broth complements cold winter afternoons beautifully. Combine all the ingredients except the salt and sugar and simmer gently for 45 minutes. Remove all the herbs and pieces of tomato with a stainless mesh screen strainer (this strains out fine particles). Save the broth! Throw out the herbs and tomato bits. Season the broth with salt, sugar and freshly ground pepper. This is an old-fashioned bouillon, so it should be clear. Bring the soup ingredients to a boil. Add the “add-ins” and cook for 3-5 minutes. Season to taste with salt and freshly ground pepper. Serve with avocado slices, gluten free sour cream (omit for dairy free), lime wedges and gluten free tortilla chips. If using a pre-cooked chicken, make sure it did not include “an added solution” or a self-basting feature, as these added fluids can contain gluten. You now have more than a quart of really fine chicken stock, and a beautifully cooked chicken that you can remove from the bones and make in to chicken salad, casseroles or whatever you prefer. If you prefer the flavor of thyme, you can use a few sprigs of thyme in place of the dill. If you like garlic, cut a few cloves of garlic in half (no need to peel) and add them. If you are making an Asian recipe with the stock, add a little sliced ginger and omit the dill. To serve food to gluten-free friends, check carefully with the manufacturers, or on the reputable internet-based gluten free food lists, making sure that all ingredients are gluten free. Or, ask your friends which brands are safe for them to eat. They will appreciate your concern! In a chowder pot (4-6 quart sized soup pot), fry the pancetta or bacon until crisp. Drain, and reserve the little pieces of fried meat on a plate off to the side. Add the butter, onions, thyme and bay leaf to the pot and stir-fry until the onions are brown. This will take 6-8 minutes. Sprinkle with the mochiko flour. Add the potatoes and stock plus enough water to cover the potatoes. Bring to a boil and simmer gently until the potatoes are just cooked through. Season the potato mixture with pepper and salt to taste. Add the cream or sour cream substitute. If you don’t want either cream, sour cream or the substitute sour cream in the soup, you can leave it out and just add a little lemon juice to balance the flavors at the end. Now, add the fish chunks and cook gently for 5 minutes – don’t boil it. Do not stir much or the fish will break up. Cover the pan and allow to sit for 10 more minutes, which will finish the cooking of the fish. Add the reserved pancetta or bacon. Taste the chowder and serve. You can sprinkle it with chopped parsley or chives, to dress it up.